Byredo Blanche: I've been dying to get my hands on this perfume after owning both the kabuki brush and hand cream versions, and I finally own it thanks to a Space NK gift card! It's such a fresh and clean smelling perfume. Perfect for daytime and never overwhelming. Everything MAKE Beauty: MAKE very kindly sent me a box of their bestsellers recently, and I've become such a huge fan. The Succulent Gel is one of my all-time favorite moisturizers and the Succulent Mist works great in tandem with it. The Moonlight Brightening Serum gives such a lush glow when mixed with a moisturizer. The Marine Salve has become a nightstand staple and keeps my lips from getting chapped overnight. I'm even obsessed with the Bronzing Bricks and Moon Sticks. Definitely a brand to try if you haven't already! 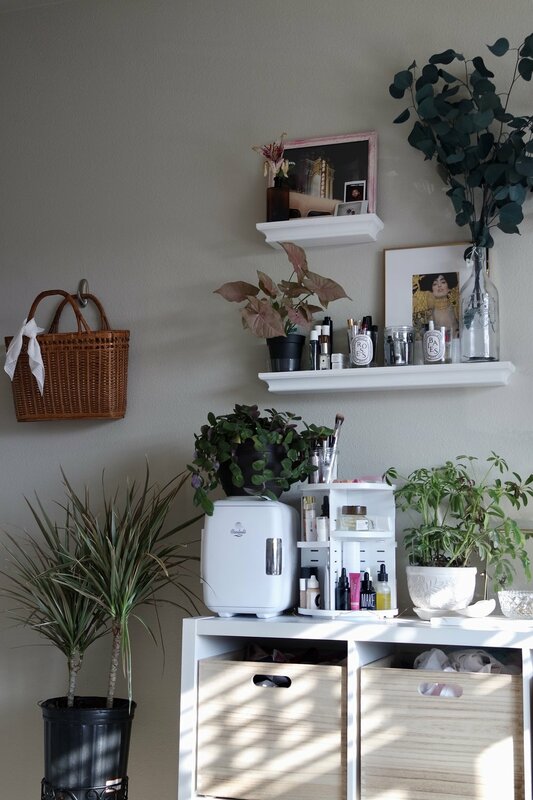 Cooluli Mini Fridge: Yes, I did by a fridge to store some of my skincare in. Yes, it was one of the best purchases I've ever made. If you struggle with puffiness, redness, or even just need to cool down your face sometimes, a mini fridge for skincare is ridiculously amazing. IT Cosmetics CC Cream: I know I'm late to this party, but wow! I use this as foundation because I can blend it thin enough to let my freckles show and build it up enough that I don't need concealer for blemishes. It also has SPF! But I still use sunscreen underneath it just in case. DryBar Sparkling Soda Shine Mist: I just want my hair to be ridiculously shiny! This helps me get there. Palmer's Cocoa Butter Formula: I was actually introduced to this by a friend who always smelled of chocolate. It's such a rich lotion that sinks in and hydrates the skin beautifully. I now faithfully slather this on every night before bed. Neutrals: I don't know what to tell you guys, lately pretty much all I want to wear is neutrals. There's something so clean-looking and easy about it. I swear 90% of my current shopping wishlist is white. Scrunchies: Is there anything more fun than a scrunch? I have them in a rainbow of colors and I love throwing my hair up in them for an effortless look or just wearing them on my wrist. Plants: I've bought so many plants these summer and they make me so happy! It's so nice having something to take care of, and greenery is such a mood booster. From my beautiful dracaena marginata, to the fresh fruits and veggies growing in the backyard, they've become such a necessity to me. They also make super cheap decorations - mine ranged from $2-30. Diptyque candles: I finally got to repurchase my all time favorite, Baies, and have also been loving Jasmin. These candles are a luxury purchase, I know, but they smell good even when you're not burning them (aka rationing them out). Gurunanda Exotics Jasmine Kiss Rollerball: I picked this up at Walmart before heading to Alaska to have something to help me sleep in place of my essential oil diffuser. It smells so ridiculously good and soothing. I rub a little on my wrists and neck before bed and it works like a charm. Kate Spade Planner: I've tried so hard in the past to maintain using planners or bullet journals, but this one seems to be sticking so far. It's easy to use, and I love how massive and pretty it is. 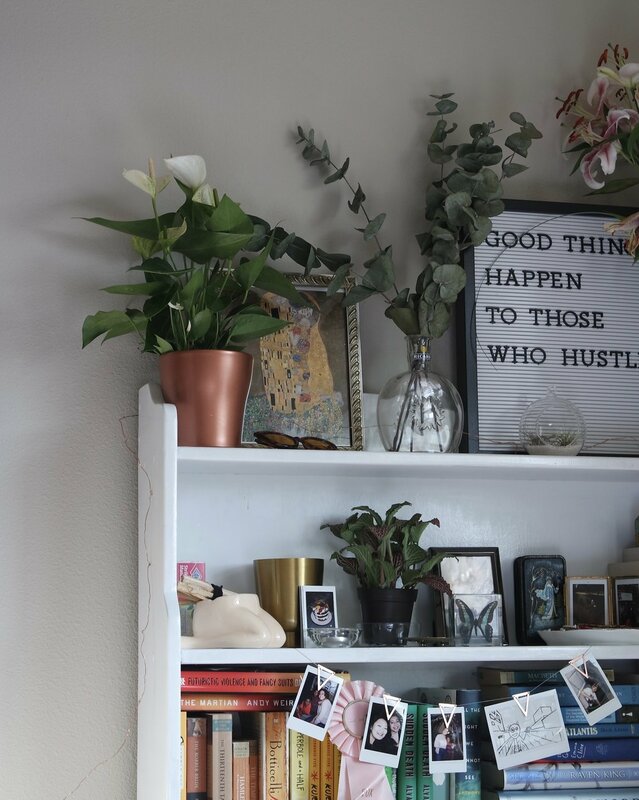 Apartment Therapy and Domino: I've been obsessively reading both of these websites for home decor, DIY projects, and IKEA hacks in preparation for moving and having a whole place to decorate instead of just a bedroom. Sharp Objects (HBO): If you like dark dramas, anything Southern Gothic, or rollerskating, this is the show for you my friends. To All the Boys I've Loved Before (Netflix): Let me just say, I hate romantic comedies, but I loved this movie. I practically smiled the entire way through it (no joke, my cheeks hurt afterwards). It features a super relatable main character, great sisterly bonds, and some awesome fake relationship antics. If you haven't seen it already, step to it! Dark Tourist (Netflix): This has to be the weirdest travel show I've ever seen. The host explores some of the creepiest, oddest, and most dangerous destinations in the world. It's sometimes hilarious, sometimes touching, and sometimes stressful. Definitely worth a watch. The Miniaturist by Jessie Burton: If you like historical fiction, I highly recommend this book which takes you into the tumultuous life of a family at the height of Dutch trade in the 17th century and a dollhouse that has sort of an insane impact on their lives. So good, and they recently made a BBC miniseries out of it! Hope the end of your summer goes wonderfully!